Before you can enter any of your own content, you might have noticed that the template we've selected has it's content pages loaded into the menu, ready to be modified. Instead of us adding existing content into their pages, we're going to start from scratch! This way, we can ensure we make pages that are unique & better suited to your business. Note: When you log onto your site, you will be redirected to your Cover Page since it was set as your home page. Each section of the Navigation serves a purpose for your website. On most templates, you have the ability to modify where you want all of your menus to sit (Left, Right or Centre of the page). We will review this in a later lesson. For now, we are going to review how each one functions on your website. All pages created in “Primary Navigation” section will show up where you would normally locate any site main menu. Notice on the template for Rally, the main site menu is located in the top right-hand corner. You will see, listed under the “Primary Navigation”, are 4 links, 1 page, and 1 page with 2 additional subpages). The links listed underneath the Navigation directly corresponds to what appears in the top right-hand corner and in what order they appear. The “Secondary Navigation” in this template is currently empty. For some templates, the “Secondary Navigation” appears at the top, near the header and other templates will have it located near the bottom. For our current template, Rally, when pages are added to the “Secondary Navigation” it will appear beside all the other items from the “Primary Navigation”. Eventually, you will be able to modify where you want your menus to sit. For instance, you could have your “Primary Navigation” located on the right hand side of your site and the “Secondary Navigation” on the left. All pages created in this section will show up in the footer of your site, right at the very bottom of your website. Notice on the template for Rally, the footer menu is showing up in the centre (3 pages). All the pages here are live pages but do not show up on any menus. This means they are accessible by URL only (through links or other means) or through search engines. As these are not your pages, you can go ahead and delete all the pages listed underneath the "Main Navigation", "Footer Main Navigation" and "Not Linked" section. Hover on each page item, and select the little garbage can. After removing all of these pages, you should be left with your Cover Page only. In the event you deleted a page and realized you still needed it, fear not! 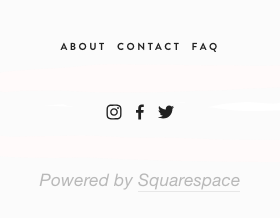 Squarespace has a section where you can view your deleted pages. Located at the bottom of your navigation is a larger trash can symbol titled "Deleted Pages". Simply click on that large garbage can and it will show you a menu of all the pages you've ever deleted. You have 30 days to restore your pages before it will be removed entirely. While this feature is handy, we do suggest only deleting pages you are 100% sure you don't need. Keep the other pages tidy in your "Not Linked" section by creating a folder for other pages, old pages, or similar. We’re one step closer to creating a website! Keep up the good work! Now that the framework has been created, it’s time to start adding pages!